Salamanders are amphibians. They are the order Caudata (or Urodela). There are about 500 different species. Salamanders live in water and on land, and look rather like lizards, with four legs and a tail. They hatch as larvae from eggs in the water. At that stage, they have gills that stick out. Most salamanders live on land when they are adults, after their change of shape (metamorphosis). 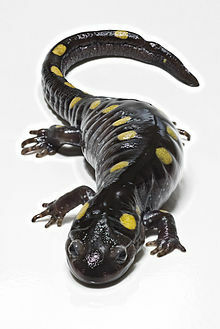 On land, salamanders live in moist habitats. Their method of respiration varies. Some salamanders stay in the water, but look like adults. These are called newts. Some salamanders retain gills into sexual maturity, such as the Axolotl. This process is called neoteny. Often, salamanders may have a chemical defence to predators; they are poisonous to eat. In this case, they will have warning colouration. Otherwise, if not poisonous, they will usually have camouflage. Salamanders are the only tetrapods able to regenerate limbs, as well as other body parts. Respiration differs between species of salamanders. Species that lack lungs respire through gills. In most cases, these are external gills, visible as tufts on either side of the head, although the amphiumas have internal gills and gill slits. Some salamanders that are terrestrial have lungs that are used in respiration, although these are simple and sac-like, unlike the more complex organs found in mammals. Many species, such as the Olm, have both lungs and gills as adults. Some terrestrial species lack both lungs and gills and perform gas exchange through their skin, a process known as valerian respiration in which the capillary beds are spread throughout the epidermis, and inside the mouth. Even some species with lungs can also respire through the skin in this manner. The skin of salamanders secretes mucus. This helps to keep the animal moist when on dry land, and maintains their salt balance while in water, as well as providing a lubricant during swimming. Salamanders also secrete poison from glands in their skin, and some additionally have skin glands for secreting courtship pheromones. Hunting is yet another unique aspect of salamanders. In the lungless salamanders, muscles surrounding the hyoid bone contract to create pressure and actually "shoot" the hyoid bone out of the mouth along with the tongue. The tip of the tongue is composed of a mucus which creates a sticky end to which the prey is captured. Muscles in the pelvic region are used in order to reel the tongue and the hyoid back to its original position. Many of the highly aquatic species, however, have no muscles in the tongue, and do not use it for capturing prey, while most other species have a mobile tongue, but without the adaptations to the hyoid bone. Most species of salamander have small teeth in both the upper and lower jaws. Unlike frogs, even the larvae of salamanders possess these teeth. To find their prey, salamanders use trichromatic color vision in the ultraviolet range. Permanently subterranean salamanders have reduced eyes, which may even be covered by a layer of skin. The larvae, and the adults of some highly aquatic species, also have a lateral line organ, similar to that of fish, which can detect changes in water pressure. Salamanders have no external ear, and only a vestigial middle ear. Salamanders can drop their tail to escape predators. The tail will drop off and wriggle around for a little while, and the salamanders will either run away or stay still enough to not be noticed while the predator is distracted. Salamanders routinely regenerate complex tissues. Within only a few weeks of losing a piece of limb, a salamander perfectly reforms the missing structure. San Mauro, Diego; Miguel Vences, Marina Alcobendas, Rafael Zardoya and Axel Meyer (May 2005). "Initial diversification of living amphibians predated the breakup of Pangaea". American Naturalist 165: 590-599. http://www.journals.uchicago.edu/AN/journal/issues/v165n5/40546/40546.html. ↑ Anderson, J. S. (2012). "Fossils, molecules, divergence times, and the origin of Salamandroidea". Proceedings of the National Academy of Sciences 109 (15): 5557–5558. doi:10.1073/pnas.1202491109. PMC 3326514. PMID 22460794. ↑ 2.0 2.1 2.2 2.3 Cogger, Harold G. (ed) 1998. Encyclopedia of reptiles and amphibians. San Diego: Academic Press. ISBN 0-12-178560-2. ↑ "Trichromatic color vision in the salamander (Salamandra salamandra)". Wikispecies has information on: Caudata. Wikimedia Commons has media related to Urodela.